The measure allows Russia's prosecutor general to ban any foreign or international organizations that are deemed a threat to Russia's constitutional order, defense or security. It also provides for fines, manual labor, and up to six years of jail time for offenders. The law follows 2012 Russian legislation allowing any group that receives foreign funding or engages in activity deemed political to be branded as a “foreign agent.” The Kremlin has also fueled a campaign to label its critics as part of a “fifth column” of national traitors that includes well-known opposition leaders like Navalny. The opposition blogger told VOA's Moscow bureau he believes the moves are part of a crackdown on dissent aimed at keeping Putin in power. "I think this is very strongly connected to the 2015 and 2016 elections,” said Navalny. “For the Kremlin, it's extremely important to eliminate any NGOs that could not only finance but could also develop programs, gather people, or be an intellectual center.” He added, “Putin wants to clear the field of any organized structures." But Navalny went on to explain he believes the Kremlin's actions are not completely cynical. "I think that it's part of the paranoia of Putin and his circle, first of all the secret services, who still believe that foreign money comes to the opposition,” he said. “They can't believe that the Moscow protests in 2011 and 2012 happened on their own as the result of Putin's corruption." Navalny was one of the main leaders of the anti-government protests, which challenged Putin's continued rule with street demonstrations numbering over 100,000 people. He was frequently arrested and was only recently released from house detention. Despite the increasing pressure, Navalny says he and other opposition leaders will fight for their right to take part in Russia's upcoming elections. “Therefore,” he added, “at the moment, we have more basic goals. We just want the right to participate in the elections." Russia's opposition movement fell into disarray as authorities arrested, pressured, and marginalized its leaders. Meanwhile, the Kremlin's annexation of Crimea last year and support for rebels in eastern Ukraine gave a huge boost to Putin's dwindling popularity. Navalny said Russia's military action in Ukraine was aimed at distracting the Russian public from domestic problems. He added, “And that will bring the people to polling stations so that they vote for the opposition." The assassination of opposition leader Boris Nemtsov in late February, just meters from the Kremlin, has helped somewhat to galvanize critics and opposition to Putin. 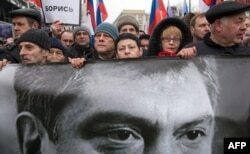 FILE - Russia's opposition supporters carrying a banner bearing a portrait of Kremlin critic Boris Nemtsov during a march in central Moscow, March 1, 2015. In a joint TV studio interview with VOA and RFE/RL, Navalny repeated suspicions that Nemtsov's death was linked to the leader of Chechnya, Ramzan Kadyrov, who enjoys almost unlimited support from Putin. Two suspects in the assassination have close links to Kadyrov, who publicly defended one of the men's character. Russian authorities failed to arrest the other suspect, who was reportedly hiding in Chechnya before fleeing Russia. Last month, Kadyrov offered to testify in the investigation, saying he had "no problem" answering questions. In the exclusive interview, Navalny also criticized Putin's declaration Thursday that any Russian military deaths from “special operations” during peace time would now be a state secret. Critics expect the presidential decree to be used to cover up Russian losses from covert military support for rebels in Ukraine. Navalny described it as “insulting and unacceptable” that a father would not be able to even know his son died in military action.